The Q'Mark BRH562 provides 5600 watts of heating capacity on 240 volts (4200 on 208). It is ideal for construction job sites, commercial workshops and other large unheated areas. 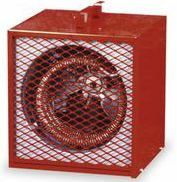 The unit features a built in thermostat, safety high limit, finger proof steel intake and discharge grills and a 6' heay duty cord with 30 amp plug. The unit also features a permantly lubricated motor, built in handle/cord storage and is painted in a high visibilty RED finish. The amperage draw is 23.3 at 240 v and 20.2 at 208v. The heater is UL listed. The Q'Mark part number is BRH562.